The original "Fake Umpires" are returning to Sunday Night Baseball at Citi Field for a one-evening engagement on August 2, benefitting UMPS CARE Charities, the non-profit established by MLB Umpires (click here for the Real Fake Umpires campaign). These real fake umps appeared in the seats behind Major League home plates throughout the United States and Canada from the 2008 through 2010 seasons before retiring to the "normal" spectating duties of attending games in street attire. 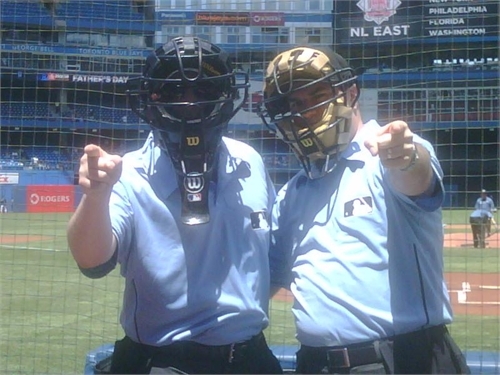 Prior to their 2010 retirement, the real fake umpires forged an association with UMPS CARE Charities, raising approximately $8,875 during their then-last hurrah in June 2010 and over $10,000 during their original run. Real Fake Umpires Tim Williams (L) and Joe Farrell. How do they get on TV? Perhaps a similar answer to why they retired: "Fake umpiring is no easy task. A lot of preparation has to go into every performance and it's extremely costly with travel, tickets, and stadium prices on food and beer. One also needs to be an expert in stadium schematics and typically only 6-8 seats in the front row in the TV shot work out of the 48,000 or so stadium seats. This act just doesn't fly 30 rows up down the left field line." As was the case during their trips from 2008-2010, the real fake umpires will be paying for the Citi Field finale trip entirely out of their own pockets. Expensive? Maybe not as much as Fenway Park in 2009, when Boston was regularly sold out! After all, how else are international fake umpires supposed to learn? Notable: Williams and Farrell officiated the June 20, 2009 Presidents' Race in Washington, DC, whereupon the umpires ejected George Washington, who drew a one-game suspension for the misconduct [Video: George Gets Tossed]. They also taught Blue Jays mascot Ace how to call a strikeout. When and Where: You can catch the real Fake Umpires Tim Williams and Joe Farrell in their farewell game at Citi Field in New York on Sunday, August 2 during ESPN's Sunday Night Baseball, first pitch is scheduled to begin shortly after 8:00 PM Eastern Time (5:00 PDT). They will be joined by the real real umpires' crew led by chief Jerry Meals, whose listed crew features Paul Emmel, Andy Fletcher, and Jordan Baker. Fletcher was the plate umpire for the July 8 game in San Francisco while 'Turtle' was UMPS CARE President Gary Darling's number two (backup crew chief) before being promoted to the full-time supervisory position. Emmel also was part of the Darling-Meals crew in 2013. Their performance will benefit UMPS CARE Charities (FB/@UmpsCare), the 501(c)(3) non-profit established by Major League Baseball umpires to provide financial, in-kind and emotional support for America’s youth and families in need. To contribute your fully tax deductible donation to the Real Fake Umpires campaign benefitting UMPS CARE Charities, visit http://www.firstgiving.com/fundraiser/tim-williams-4/the-real-fake-umpires.